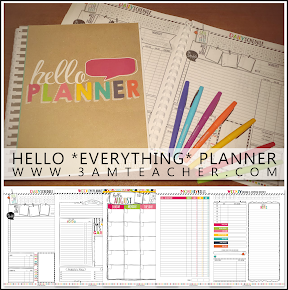 I apologize for the double post tonight...but...I was sent an email from a creative gal named Jessica Clark and she shared a template she made with my graphics that she has put as her VERY FIRST (and FREE) product on TPT. I am her first follower (HA), but I would really appreciate it if you checked her out and followed her TPT store. Lets give her some Bloggy support and give her some warm feelings as her following increases.. I am still excited when I see those numbers go higher...so lets overwhelm her with love... Click the preview of her template below to visit her TPT store and download her very first freebie product!!!! Thank you for sharing -- you are inspiring lots of teachers to say -- "Maybe I could get some of this great clip art and do that..." But I can't stay up until 3 to work on it tonight, so I just downloaded this one!! Thanks for sharing this... it is such a cute idea! I teach 4th so they would probably laugh if I gave them paper with the big writing lines, but my kiddos LOVED reading the Lorax last week (and a bunch of them were planning to see the movie this weekend) so I'm thinking I can adapt it and make something with the regular writing lines for my class! Thanks! I just gave you an award! :) Please head to my blog to pick it up. :) I can't wait to pick up your Kevin Henkes clip art! I missed the midnight deadline being out of town - but that will not stop me from getting it haha! Henkes is my favorite author! :) Thanks for all of your wonderful work!